1929 (i.e. 1965) Gary Memorial Medal. Gold (14K), 94.5 mm, 583.2 grams, 10.94 oz troy AGW. By Paul Manship. Murtha-247. Mint State.Edge marked MEDALLIC ART CO. N.Y. 14K. 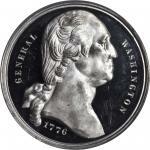 Obverse portrays left facing portrait of Elbert Henry Gary, founding chairman of United States Steel Corporation. Reverse shows two winged victories lowering a laurel wreath onto the head of a bare-chested blacksmith at his forge, representing the awards recipient, in this case THOMAS F. PATTON, whose name and 1965 date of awarding is engraved below. The Gary Memorial Medal is the American Iron and Steel Institutes highest award, instituted in 1929 and awarded almost yearly ever since. Thomas F. Patton, then Chairman and President of Republic Steel Corporation, one of Americas Big Three steel manufacturers, received this award on May 27, 1965 for "Outstanding achievements in guiding the affairs of American Iron and Steel Institute better to serve its industry and the country, [his] industrial leadership during periods of adversity and crisis, the important role [he] played in the organization and successful administration of [his] company and for [his] devotion to the interests of the iron and steel industry throughout [his] career." This gargantuan, rich yellow gold award medal is housed in its original fitted clamshell case and is the distinctive work of famous 20th century sculptor Paul Manship, whose prolific sculpture graces museum collections, building facades and public spaces around the world. His most famous sculpture, the 1934 gilded Prometheus that overlooks the skating rink at Rockefeller Center in New York City, is enjoyed by the tens of millions of visitors who visit New York City each year. His medallic work is also prolific, and collected by dedicated aficionados of his oeuvre ; he modeled a variety of portrait medals but also created works for industry, such as this Gary Award Medal, the 1934 Carnegie Corporation Medal and the 1930 Southern Railway Systems Centennial Medal, among others. His most widely distributed medals are the 1930 Dionysus for the Society of Medalists and the 1960 John F. Kennedy Inaugural Medal. In general, though, the medallic works of Paul Manship were produced in very limited editions, and even medals like the Gary, now awarded for 90 years, are very rare in the marketplace. Many are permanently locked up in corporate collections and recipients families, and some were undoubtedly melted down during the 1980 and 2011 run ups in the price of gold with little regard for their numismatic or artistic value. Only 2 offerings of a Gary Award Medal in the last 2 decades were found at Invaluable.com, leaving the current offering as a very rare opportunity to acquire a superb work by one of the most famous 20th century American sculptors in the most noble medal possible.